Download "ARCHERY Environmental Education Lesson EDWARDS CAMP AND CONFERENCE CENTER"
1 ARCHERY Environmental Education Lesson EDWARDS CAMP AND CONFERENCE CENTER SUMMARY Students will learn the parts of a bow and arrow, and archery techniques and safety. They practice what they learn, shooting at targets. Once the students feel comfortable using the bow and arrow they can have competitions with other students, based upon accuracy of hitting the targets. USAGE There are two (2) ranges located off the driveway to the lodges. Cabin groups use range A (with a cement landing) located on the left and lodge groups use range B on the right. This activity is dependent upon the weather. If it is raining, or below freezing it is not advisable to use the equipment. 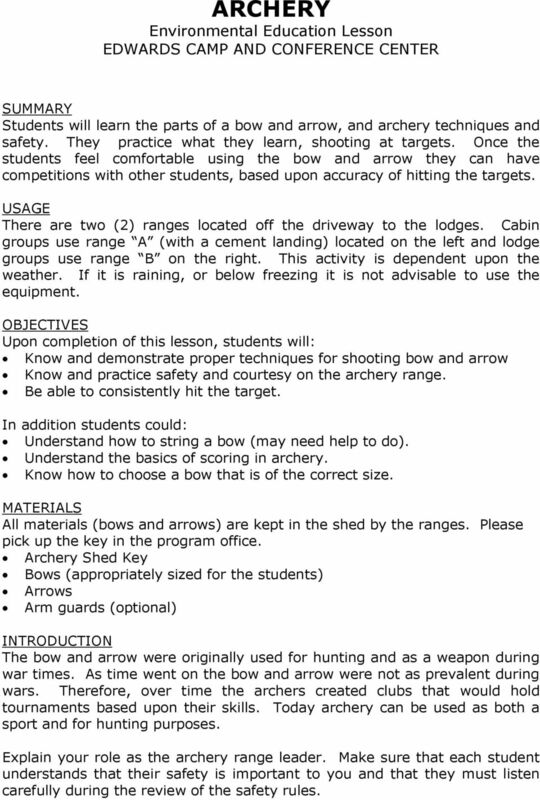 OBJECTIVES Upon completion of this lesson, students will: Know and demonstrate proper techniques for shooting bow and arrow Know and practice safety and courtesy on the archery range. Be able to consistently hit the target. 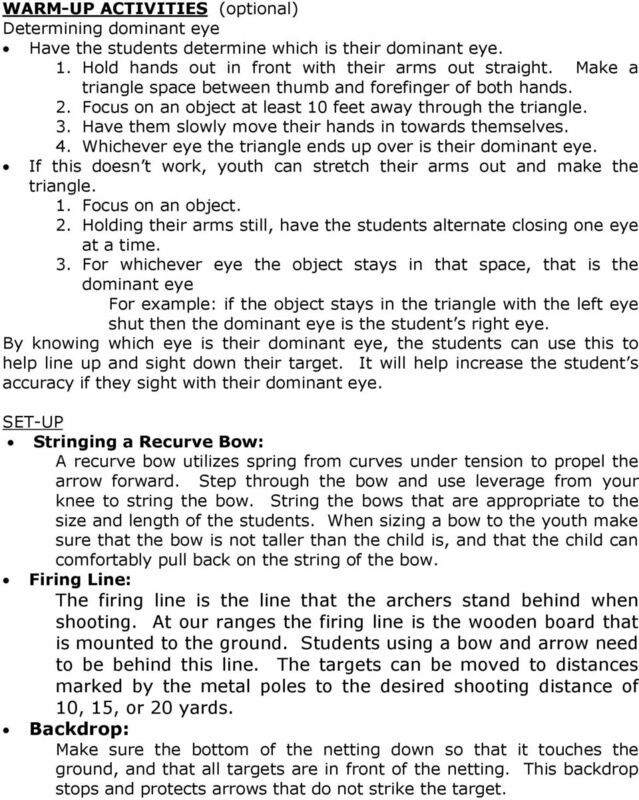 In addition students could: Understand how to string a bow (may need help to do). 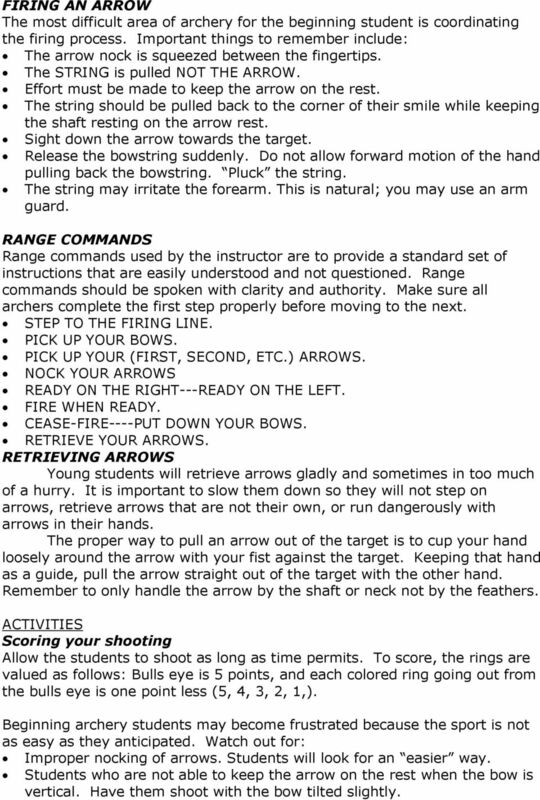 Understand the basics of scoring in archery. Know how to choose a bow that is of the correct size. MATERIALS All materials (bows and arrows) are kept in the shed by the ranges. Please pick up the key in the program office. Archery Shed Key Bows (appropriately sized for the students) Arrows Arm guards (optional) INTRODUCTION The bow and arrow were originally used for hunting and as a weapon during war times. As time went on the bow and arrow were not as prevalent during wars. Therefore, over time the archers created clubs that would hold tournaments based upon their skills. Today archery can be used as both a sport and for hunting purposes. Explain your role as the archery range leader. Make sure that each student understands that their safety is important to you and that they must listen carefully during the review of the safety rules. 2 WARM-UP ACTIVITIES (optional) Determining dominant eye Have the students determine which is their dominant eye. 1. Hold hands out in front with their arms out straight. Make a triangle space between thumb and forefinger of both hands. 2. Focus on an object at least 10 feet away through the triangle. 3. Have them slowly move their hands in towards themselves. 4. Whichever eye the triangle ends up over is their dominant eye. If this doesn t work, youth can stretch their arms out and make the triangle. 1. Focus on an object. 2. Holding their arms still, have the students alternate closing one eye at a time. 3. For whichever eye the object stays in that space, that is the dominant eye For example: if the object stays in the triangle with the left eye shut then the dominant eye is the student s right eye. By knowing which eye is their dominant eye, the students can use this to help line up and sight down their target. It will help increase the student s accuracy if they sight with their dominant eye. SET-UP Stringing a Recurve Bow: A recurve bow utilizes spring from curves under tension to propel the arrow forward. Step through the bow and use leverage from your knee to string the bow. String the bows that are appropriate to the size and length of the students. When sizing a bow to the youth make sure that the bow is not taller than the child is, and that the child can comfortably pull back on the string of the bow. Firing Line: The firing line is the line that the archers stand behind when shooting. At our ranges the firing line is the wooden board that is mounted to the ground. Students using a bow and arrow need to be behind this line. The targets can be moved to distances marked by the metal poles to the desired shooting distance of 10, 15, or 20 yards. Backdrop: Make sure the bottom of the netting down so that it touches the ground, and that all targets are in front of the netting. This backdrop stops and protects arrows that do not strike the target. 3 RANGE RULES The instructor is in complete control. Listen carefully. No more than six (6) students should be shooting at targets at the same time. One or two shooters at each target. No one passes the firing line until all arrows are fired and permission is given by instructor Handle the arrows by the nock and the shaft. DO NOT TOUCH THE FEATHERS. Each shooter has 3-5 arrows for the round. Be aware of where YOUR arrows are at all times. Do not dry fire your bows this is releasing the bowstring without an arrow nocked. Only point at what you plant to shoot at. No horseplay the bow and arrow is a weapon. Think SAFETY at all times. 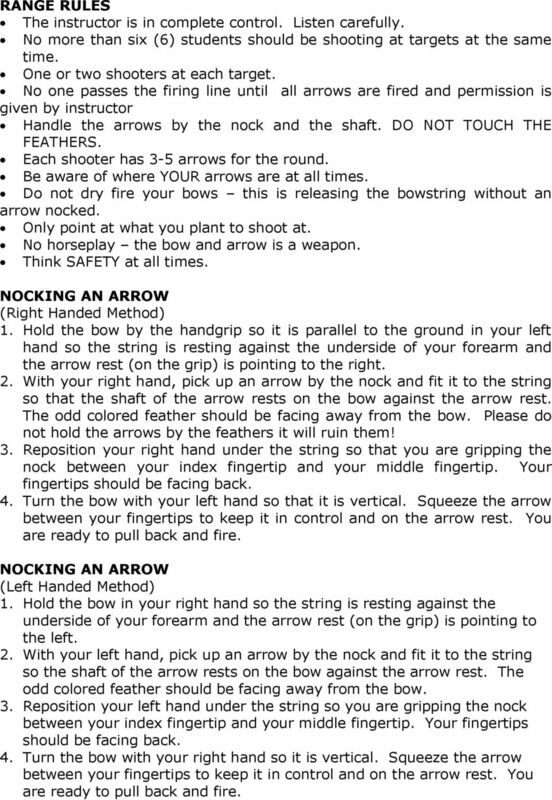 NOCKING AN ARROW (Right Handed Method) 1. Hold the bow by the handgrip so it is parallel to the ground in your left hand so the string is resting against the underside of your forearm and the arrow rest (on the grip) is pointing to the right. 2. With your right hand, pick up an arrow by the nock and fit it to the string so that the shaft of the arrow rests on the bow against the arrow rest. The odd colored feather should be facing away from the bow. Please do not hold the arrows by the feathers it will ruin them! 3. Reposition your right hand under the string so that you are gripping the nock between your index fingertip and your middle fingertip. Your fingertips should be facing back. 4. Turn the bow with your left hand so that it is vertical. Squeeze the arrow between your fingertips to keep it in control and on the arrow rest. You are ready to pull back and fire. NOCKING AN ARROW (Left Handed Method) 1. Hold the bow in your right hand so the string is resting against the underside of your forearm and the arrow rest (on the grip) is pointing to the left. 2. With your left hand, pick up an arrow by the nock and fit it to the string so the shaft of the arrow rests on the bow against the arrow rest. The odd colored feather should be facing away from the bow. 3. Reposition your left hand under the string so you are gripping the nock between your index fingertip and your middle fingertip. Your fingertips should be facing back. 4. Turn the bow with your right hand so it is vertical. Squeeze the arrow between your fingertips to keep it in control and on the arrow rest. You are ready to pull back and fire. 4 FIRING AN ARROW The most difficult area of archery for the beginning student is coordinating the firing process. Important things to remember include: The arrow nock is squeezed between the fingertips. The STRING is pulled NOT THE ARROW. Effort must be made to keep the arrow on the rest. The string should be pulled back to the corner of their smile while keeping the shaft resting on the arrow rest. Sight down the arrow towards the target. Release the bowstring suddenly. Do not allow forward motion of the hand pulling back the bowstring. Pluck the string. The string may irritate the forearm. This is natural; you may use an arm guard. RANGE COMMANDS Range commands used by the instructor are to provide a standard set of instructions that are easily understood and not questioned. Range commands should be spoken with clarity and authority. Make sure all archers complete the first step properly before moving to the next. STEP TO THE FIRING LINE. PICK UP YOUR BOWS. PICK UP YOUR (FIRST, SECOND, ETC.) ARROWS. NOCK YOUR ARROWS READY ON THE RIGHT---READY ON THE LEFT. FIRE WHEN READY. CEASE-FIRE----PUT DOWN YOUR BOWS. RETRIEVE YOUR ARROWS. RETRIEVING ARROWS Young students will retrieve arrows gladly and sometimes in too much of a hurry. It is important to slow them down so they will not step on arrows, retrieve arrows that are not their own, or run dangerously with arrows in their hands. The proper way to pull an arrow out of the target is to cup your hand loosely around the arrow with your fist against the target. Keeping that hand as a guide, pull the arrow straight out of the target with the other hand. Remember to only handle the arrow by the shaft or neck not by the feathers. ACTIVITIES Scoring your shooting Allow the students to shoot as long as time permits. To score, the rings are valued as follows: Bulls eye is 5 points, and each colored ring going out from the bulls eye is one point less (5, 4, 3, 2, 1,). Beginning archery students may become frustrated because the sport is not as easy as they anticipated. Watch out for: Improper nocking of arrows. Students will look for an easier way. Students who are not able to keep the arrow on the rest when the bow is vertical. Have them shoot with the bow tilted slightly. 5 Students using their finger as a guide. This is dangerous, may damage the arrow, and will affect accuracy. Students throwing the arrow. Be sure they pluck the bow. Students using their thumb on the bowstring. This means they are pulling back the arrow and not the string. This creates stress on the arrow and affects accuracy. WRAP-UP At the end of the lesson discuss the items the students have learned. Including: the parts of the bow and arrow, the safety rules since the bow and arrow can be a weapon and that it should be used responsibly. 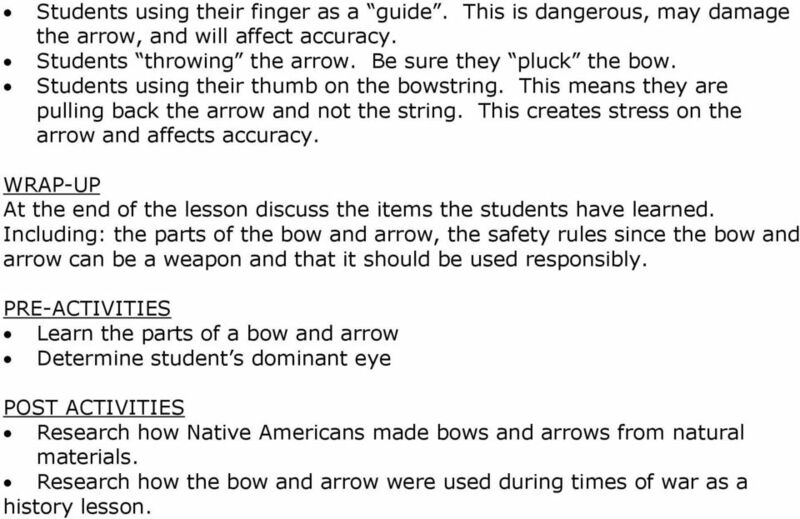 PRE-ACTIVITIES Learn the parts of a bow and arrow Determine student s dominant eye POST ACTIVITIES Research how Native Americans made bows and arrows from natural materials. Research how the bow and arrow were used during times of war as a history lesson. Fishing Level 1 Fishing Basics Prerequisite: Knots Level 3 Fishing Basics Fishing is a great past time and a way to enjoy being out in God s great creation and that could just mean enjoying a lake nearby.